One question that we are frequently asked is how to sort bookmarks alphabetically in Chrome and Firefox. We’re happy to tell you that it is quick and easy to do both browsers. Open Chrome, click CTRL+ SHIFT + O (not zero) and Chrome’s Bookmark manager will open, Now click on the 3 horizontal dots icon on the far right edge (see the screenshot below). 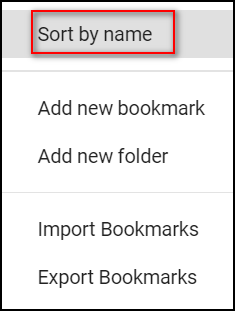 From the drop-down menu that appears, click on “Sort by name” to put your Chrome bookmarks in alphabetical order. If you have created your own folders in Chrome bookmarks, you will need to open your main Bookmarks folder ( CTRL+SHIFT+O (letter O not number zero). Highlight the folder (it will be in the menu on the left) you want to sort and click the menu icon (3 vertical dots) and click “Sort by name” Do this for each folder. However, if you have sub-folders in a folder each one of those has to be done individually if you want all files in each sub-folder sorted by name. Sorting the parent folder sorts the contents of the parent folder by name. it does not sort the contents of each sub-folder by name. You will have to do each of those individually too. Open Firefox bookmarks manager by using the shortcut CTRL+SHIFT+B. Then click on “Views” on the menu at the top of the window. 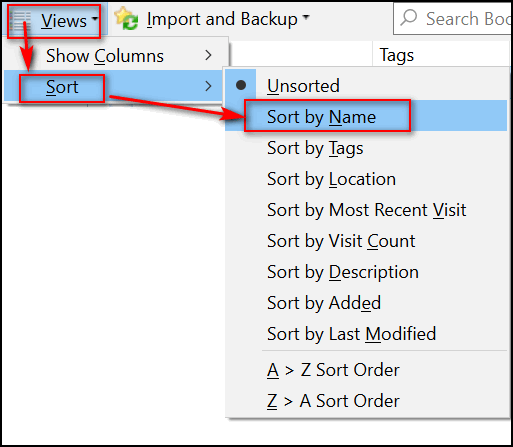 Then choose “Sort” and “Sort by Name”. That’s all there is to it. Note that Firefox gives you many different sort options including A to Z and Z to A. Great tips. Love you guys! in checking my bookmarks they are still not alphabetically sorted !! I need to know why your tip to sort Bookmarks in Chrome did NOT work……please let me know what I may have done wrong…..this was a great tip and I’d like to know how to do it. I can’t tell you why it didn’t work for you or why you didn’t see the screen shot we showed. I don’t see any sorted folder when I click the settings icon (3 dots). We tried this on 3 different Windows computers – we did not try it on Android devices or anything else. All I can tell you is that it works for me an others. Hi Don, You have to click on each individual folder and subfolder. Then the 3 dots and sort by name. Hi Pam, thanks. But it’s not necessary to click on sub-folders unless you have nothing in your main bookmarks folder. But Don can try your suggestion… maybe you and he are much more organized than I am and have everything neatly placed in folders. Thanks so much for this quick tip. It’s about the only one I’ve been able to do without questions. So much faster than reading thru all bookmarks. Thanks again for all your great ideas! I am not sure what a Cookbook bookmark is, but if you have many folders in it I’m assuming it’s a folder in your bookmarks folder. If so you can export all bookmarks to an HTML file that you can import bookmarks from on any Windows computer using any compatible browser. See this page if you’re using Chrome. 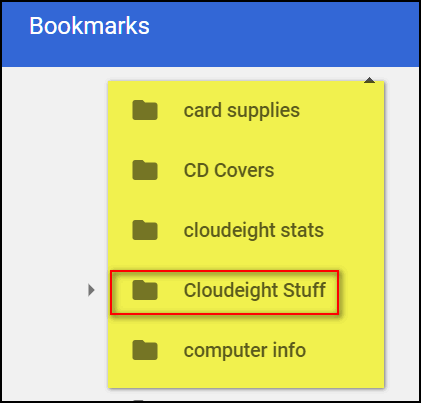 for instructions on how to export bookmarks. If you’re using Firefox, see this page. Worked perfectly in Chrome, and also in Slimjet. This is a correction to my post of 3/6/18 : Your tip finally worked for me (but with slight changes)……..I RIGHT-ClICKED on “Other Bookmarks” > Clicked on “Bookmark Manager” > Clicked on “3 white dots” (which is NOT called “Settings”, but in my version of Chrome it is called “Organize” icon > Clicked on “Sort By Name” Then my bookmarks WERE alphabetized !! Great Chrome Bookmarks tip…….Thanks SOooo much !!! Google recently updated and in doing so may have forgotten some of your settings. Please read this article and follow the instructions to you will get our newsletters again.